If you’ve ever laid eyes on one of the many murals around San Francisco featuring giant, blue bears and wondered about the artist responsible for them, you will envy our after-school tutoring students who, on Tuesday, April 24, enjoyed a discussion and presentation from the creator of the blue bears, among other fantastic cartoons, Sirron Norris. Sirron is a local artist whose work can be viewed at Jay’s Cheesesteaks, Balmy Alley, Clarion Alley, and his own studio. 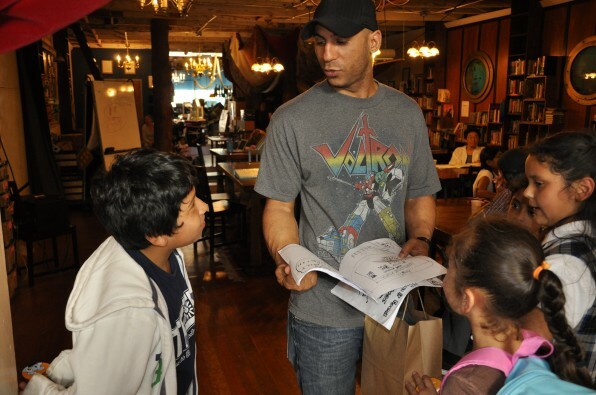 He is also an educator offering cartooning workshops to the public. Sirron shared a colorful slideshow of his paintings and talked about his process as an artist attempting to find balance between creative and commercial success. He provided valuable insight to our students in regard to what it takes to turn your passion into a fruitful career, such as the need to compromise and to adapt to new technologies allowing art to reach a wider audience. Sirron was our third presenter in our guest speaker series for after-school tutoring. We aim to further connect students to the arts in hopes that they will be further inspired. This entry was posted in 826 News, After-School Tutoring, Featured and tagged After-School Tutoring, Guest Artist Series.